The All Progressives Congress APC has again knocked the Peoples Democratic Party PDP for attempting to wash away alleged past infractions of its Presidential Candidate, Atiku Abubakar. Spokesman of the APC, Yekini Nabena in a statement Thursday said the issue of integrity would continue to be debated ahead of the 2019 general elections. He said; “A spokesperson for the Peoples Democratic Party PDP, Mr. Kola Ologbondiyan released a statement accusing the senior officials of the All Progressives Congress-led administration of “deliberate efforts impugn on the character” of the PDP presidential candidate, Alh. Atiku Abubakar. “The PDP’s assertion particularly coming from its spokesperson is ironic and laughable, given the fact that Mr. Kola Ologbondiyan as an editor with one of the national newspapers in fact unearthed the Special Audit/Forensic Investigation of Petroleum Technology Development Fund (PTDF) which indicted Alh. Atiku Abubakar, then Vice President for the mismanagement of the Fund. Nabena added that “Alh. 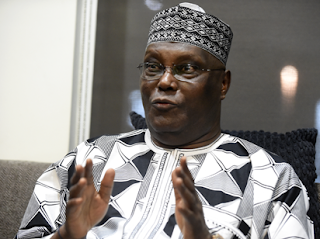 Atiku Abubakar grapples with several other corruption indictments. This is a fact and reality he needs to deal with and come clean about”. According to him, the “PDP cannot be simplistic and attempt to wish away the issue of the integrity of candidates seeking elections into positions at all levels, particularly as 2019 approaches. We reiterate our position that the Nigerian electorate must have that opportunity to choose from candidates that can pass the integrity and anti-corruption test. The character of office holders we elect into public offices is important as our very progress and development as a country depends on it.